I had not been on the Ship very long when I had my first experience of the Mothership’s Oversoul. I had been there long enough, however, to understand that the ship was a living, multidimensional being. I had a vague understanding of the sixth dimensional areas of the ship. However, the seventh dimensional portion of the ship is not an “area. I had not been on the Ship very long when I had my first experience of the Mothership’s Oversoul. I had been there long enough, however, to understand that the ship was a living, multidimensional being. I had a vague understanding of the sixth dimensional areas of the ship. However, the seventh dimensional portion of the ship is not an “area.” It is a formless soul that overlooks all the souls who reside on the ship. The super-subconscious frequency of the ship automatically observes, repairs and updates the basic structure, which is always changing. Therefore it holds the basic form of every component of the ship. On the other hand, the Oversoul consciousness is a formless, yet tangible energy that feels like an electrical field filled with love and cohesiveness. These feelings usually are most predominant on the upper areas of the ship, such as the bridge and all command centers. However, when necessary, the Oversoul over- lights meetings, individuals, and devices on the ship that are called upon to function at an exceptionally high state of consciousness. I was taken to the Mothership shortly after I had left “time” during my meditation. Once I could leave time, a vast array of new abilities lay just beyond my reach. Hence, I was taken to the Mothership for more advanced studies. 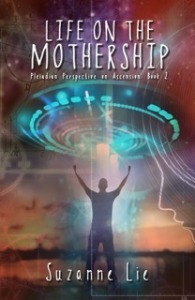 The Arcturian and I entered a scout ship and headed for the Mothership. There were just the two of us in the ship.